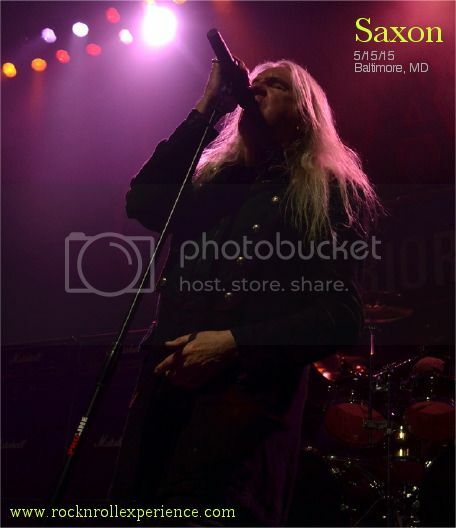 Blending the best of Iron Maiden, Judas Priest, and Black Sabbath, Saxon returned to Baltimore on May 15, 2015 and Biff commented midway through the show that he enjoyed Rams Head Live because they advertised the show much better than the last venue they played at in Baltimore; The turn out was good and the band rocked hard for the die hards in attendance. The crowd was an interesting mix of newer fans mixed with guys who had clearly been their since day #1 and they came out with Saxon denim vests-a-plenty! At one point Biff asked a fan to hand him her jacket and he wore one of the Saxon denim jackets for “Crusaders” which he signed immediately afterwards. 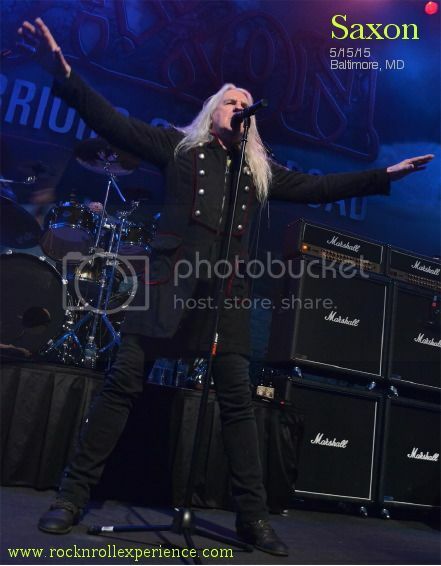 Biff commented that the band’s next stop was Rock on the Range with Judas Priest and that he hoped to see a few of the people from Baltimore there. The logistics was a definite possibility but making a 7 hour drive was was something no one in that room other than Saxon were about to do on a whim. Set wise Saxon played all the classics and only tossed a few newer ones in which made the fans quite happy. Biff reminds me of the Crypt Keeper with his long white hair which drapes his time tested cranium. It’s amazing that the band can still rock so hard at their age and that their fanbase never forgot them. What struck me during this performance was that Saxon should have been as big as Judas Priest here in the States because their style is similar, their sound is the same, and they are a damn good band....they just never got the same exposure that Priest did here. Saxon sounded great, they rocked hard, and I give the band credit for still doing what they do best!